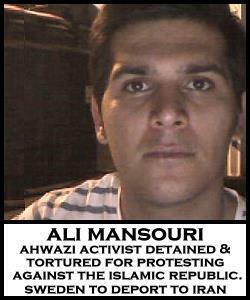 On 26 August 2011, the Swedish government attempted to deport anti-regime activist Ali Mansouri back to torture and possible execution in Iran. Having defeated all legal measures to stop Ali’s deportation, the Swedish Migration Authorities did not count on the tenacity of progressive social forces in Sweden. Swedish, Iranian and other asylum rights activists, and the leadership of Sweden’s Justice Party (Rättvisepartiet-Socialisterna), staged a protest at the airport that extended into the airplane itself where activists urged the pilot not to participate in the illegal deportation of an Iranian activist at risk of the worst forms of persecution in the hands of the Islamic regime. And that day, the deportation of Ali Mansouri was halted. The day’s events garnered coverage in Sweden’s largest newspaper, Aftonbladet). It was thus a devastatingly unexpected turn of events when we learned that on 23 September 2011, the Swedish government had implemented its criminal deportation of Ali Mansouri. The Swedish bureaucracy, rather than further investigate Ali’s case after activists went to such lengths to stop his deportation in August, decided to continue its criminal and inhumane approach to dealing with asylum issues. No one in the migration authority’s bureaucracy upheld the international mandate to assist refugees in seeking asylum and protection, which is naturally what one expects from a government that claims it has respect for human rights, rather than doing all in its power – both legal and in many cases illegal – to deport asylum-seekers to brutal persecution in their home countries. On 23 September 2011, the Swedish Migration authorities went to extreme lengths to avoid activists who would have intervened to assert Ali Mansouri’s rights. They removed Ali Mansouri from the Märsta detention center with his hands and feet shackled like a violent criminal instead of a persecuted human being with a legitimate right to seek asylum. They forcibly boarded him on a small private plane and chained him to his seat; that plane took Ali to Amsterdam, where he was again forcibly boarded onto a passenger flight to Tehran, Iran. Throughout this process, Ali was physically and verbally abused by both Swedish and Dutch authorities. Among other things, two male Swedish police officers sat with the full force of their weight on Ali for approximately 45 minutes while his hands and feet were bound in shackles. This has resulted in injuries to Ali from which he still suffers. The Dutch police verbally abused Ali throughout the process of forcing him onto the plane in Amsterdam, where they again chained him to his seat. Ali shouted out to the other passengers for help, and numerous honorable people on board the plane stood up in protest and refused to sit down. The pilot of the airplane did all that he could to urge passengers to sit down; they ignored him. One passenger stood up and spoke to the rest of the people on the flight, saying among other things that “Those who do not stand up to defend this kid’s rights are lower than stray dogs!” By the end of the passenger’s statement, people were in tears, including the flight attendants, who also resisted the pilot’s entreaties to sit down. In the end, the pilot had no choice but to taxi back to the gate and de-board Ali Mansouri. Ali was then sent back to Sweden, and is once again in Märsta Detention Center. This is the vicious and ugly reality of the Swedish government, a member in good standing of the part of international society that represents an inhumane governance. Such inhumanity, thanks to social media (rather than corporate-controlled media), can no longer be hidden from public view: this inhumanity and criminality is the real face of the Swedish government. This inhumanity is grounded in ignorance and fed by the backward elements in our societies. The inhumane and indeed criminal politics of the Swedish government are only supported by the most ignorant and very marginalized fascist, nazist, and racist social forces. Mr. Billström, who has opened an account that banks on the anti-human sentiments of the ignorant, the racist, and the Nazi, had better wake up and smell the coffee. The whole world is entering an era of mass protest against injustice: in the Middle East, in European countries, in the United States. Mission Free Iran will advocate for the mobilization of the progressive forces of Swedish society against the criminal inhumanity of the right wing of Swedish politics for the next election. Progressive Swedish society demands humane laws and a humane governance. We are going to see to it that the Swedish government is held responsible for violating the rights of Ali Mansouri, and everyone else whose rights have been so brutally – even lethally – violated by the Swedish Migration Office and the right-wing government that backs its politics. For every Iranian who is deported, at least 30-40 people from African and Asian countries are deported; planeloads of Iraqi asylum-seekers are flown back to the war-torn hell that Iraq has become. All of them are mishandled and treated as cattle, rather than the human beings they are. We will hold the Swedish government responsible and accountable. We believe Swedish society deserves better. Billström dared to say said that “the people” support the inhumane policies of the Swedish government. He declared that Swedish people are against those activists who gather outside the migration offices & detention centers to demand a halt to asylum-seekers’ deportation. Of course, Billström, you and your ilk are proud of your police, but we are ashamed that these kinds of people are bearing weapons and have authority to do what they have done to Ali and countless others. Billström: When you mentioned “the people” that you say support your position, everybody knows who you are calling “the people” – these are the ignorants, the nazis, and the the racists of the society. The real people are those who saved Ali from both your first and second attemps to deport him. These are “the people,” and they stand on the side of humanity. « We Demand an End to Assad’s Regime. We Demand Effective Protection for Syrian Revolutionary People. We Demand Responsibility and Accountability. I agree with Free Mission Iran. Mr. Billström is nazi. People must not vote for this kind of ugly people. C,est violence drastique de droits humannes! Le Swede, qu,elle se proclame comme etat democratique, devrait avoir l,honir, pour faire cettes actes de prosecution de refugees politiques! Et je soutiens le decision le tribunal pour droits humanes a Strasbourg qu,ill a condame traitement de Swede!